I was just talking about this in another thread. I tried the Super Slinkies (9s) for the first time and I'm not sure I like them. They are so thin that I don't have the same feel on the strings. Even though I have pretty small fingers, I still feel like they are almost too slippery or something. I also noticed that my pickslides aren't as effective as they were before. I've used 009-042's for as long as I can remember . 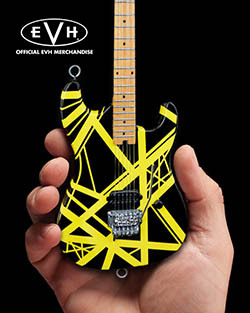 EVH's newer signature strings are 009-046 , no doubt to have a slightly heavier bottom for when using his D-tuna . Yngwie also uses a hybrid set with a 008 for the high E string . I'm sure that helps his wicked high over bends and vibrato - one of the most well known in the biz . Skinny Top Heavy Bottoms are 10-52, I recommend everyone try them once if you haven't before. I've been using Daddario 9 thru 46 for about 7 or 8 yrs. now. Favorite gauge by far regardless of manufacturer, but they are awesome strings. Before that it was Boomers 9 thru 42 for most of my yrs. playing. It wasn't until I started noticing some irregularities with intonation. I had some guitars like a Strat, and just a string change within the same gauge, and I've have to move some saddles almost all the way back cause they'd be so sharp. It was always the low E, and D that would be real wonky, then the next set, you'd have to move them all the way forward. Real pain with a Floyd too. Think it was in how they were wound....Must have changed something around that time. I used to hate Daddarios' years ago...They just seemed dead compared to Boomers, or EB's, but over the past decade, they've got it nailed. They last forever without breakage, and with whatever alloy they use, they stay very lively sounding with almost no corrosion, and the intonation is rock solid between sets. Do you guys prefer finished or unfinished necks? I sanded my first neck at 13 years old and haven't owned a guitar that I kept the finish on since. I prefer unfinished, but even just steel-wooling a finished neck goes a long way. I hate necks with glossy finishes...They always make your hand stick. I usually hit any glossy finished neck with steel wool or a fine sandpaper. Ed's EVH strings come in different gauges...the basic set is actually a 009-042 set just as his old "5150" Ernie Ball strings were in the 80s. The set with the 046 on the bottom is just another option that probably was designed to work a bit better with the D-Tuna or for drop D in general. I don't care really. My '68 strat has a glossy finish on the neck and I like it. My black Musikraft "5150" replica has the Tung oil finish and so does my '78 black and white Frankenstein replica...they both feel great. One thing that is a little difficult to get used to is a painted neck with no clear coat...Clapton didn't like that on his "Fool" SG and I know Ed didn't love that either, though the original Ibanez Destroyer (both in it's white painted phase and in it's "Shark" phase) had a painted neck with no clear coat and so did the Chris Holmes Destroyer. My white painted '75-'76 Ibanez Destroyer has no clear coat just like Ed's and it is something I just had to get used to. I love the way the white paint looks without a clear coat, plus I figure Ed played his Destroyer for a very long time like that and he got used to it, so I know I sure as hell can get used to it. Right you are , brother . I didn't word my post properly . Oops ! Last edited by RRvh1; 05.09.14 at 01:29 PM. I have this ESP LTD KH202 from a couple years ago, and I finally got around to replacing the bland bridge pickup for a Custom Custom I had laying around. The stock KH pickup wasn't terrible, but it was way too muddy and dark, and lacked clarity. Adding the CC made it sound 100 times better. Now it has depth, clarity, and the CC just gives it this lively character it lacked before. I also sanded all the gloss off the back of the neck, and it feels much better and smoother now too. It's amazing how just two simple things like this make a guitar go from "pretty good" to "awesome" in an hour. Depends on what tuning I'm in when it comes to strings. For standard and half step down, then 9-46 are perfect. A whole step down, and I'll definitely go with 10-46. Otherwise there's too much give in the lighter gauge and it just feels sloppy.